Can Gen X Grow Up With the Web? Think Different. 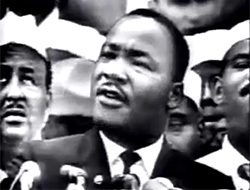 Those two little words kicked off Apple’s 1997 ad campaign, which featured historical figures such as Martin Luther King Jr. and John Lennon in black and white footage and still photos. Think Different was brilliant marketing because it acted like a siren call for anyone who sensed that a growing world of possibilities was beginning to take shape on the Web. Think Different. Those two little words kicked off Apple’s 1997 ad campaign, which featured historical figures such as Martin Luther King Jr. and John Lennon in black and white footage and still photos. Apple’s initial television spot ended with a young girl opening her eyes to what we can only imagine to be a brave new world of opportunity. As with most hit commercials, Apple’s theme touched a raw nerve of inspiration with so many of us–especially those of us who had recently graduated from college and were dubbed the “slacker” generation or Generation X. Leaving school in the early 1990s wasn’t too different from today. The economy was barely recovering, globalization was all the rage–China and India loomed large on the horizon–and Corporate America was still smarting from what seemed like a decade of non-stop restructuring. Publishing wasn’t much different either. In the wake of the 1989 recession, magazine publishers were practically evaporating. In 1992, many magazine shut down; and newspapers dropped in circulation–mostly owing to the explosion of cable news channels. And book publishing was consolidating. Think Different was brilliant marketing because it acted like a siren call for anyone who sensed that a growing world of possibilities was beginning to take shape on the Web. The Web was different. It held so much allure early on because it couldn’t be controlled–not by the government nor Corporate America; it offered endless possibilities, autonomy and freedom. Best of all, like all good revolutions, older generations didn’t seem to “get it”. Many found the Web mysterious, fruitless, pointless, profitless and totally incomprehensible. That anti-Webby sentiment fueled those of us who were passionate about the big changes that we felt would come to learning, communicating, socializing and just about everything we do. Nearly fifteen years later the young generation that was once upon the barricades is now coming of age in established positions across all sectors of life. It’s a common pattern: at some point you cut your hair and stop protesting the war. Or in this case your blog becomes part of the company’s intranet. No longer is the Web a sideshow, but now it’s front and center and so, too, are many of those college grads who are now entering leadership positions. But can the generation that helped foster the so-called “digital revolution” now reinvent our businesses with digital media at the center rather than the fringe? On the face of it, you’d think the answer would simply be: “Hell yes!” But nothing is that simple. For all the progress the Web has made in mainstream America, it’s still retained much of its birthright as a alternative publishing vehicle for the masses who want to get their words out fast. Moreover, our print-centric lifestyle persists in powerful ways even as we are texting ourselves to oblivion while driving down our highways. Print still retains a legitimacy as something special. For me, as a publisher, it’s clear that authors still want to publish books and newspaper articles and see their names in magazine type. 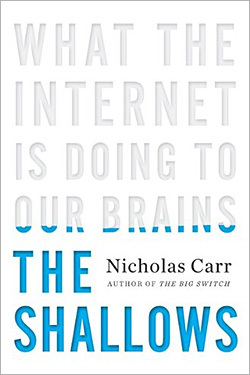 Increasingly, we see a duality getting pressed into our minds that print is for reading and Web is for scanning or skimming, as Nick Carr argues in his book The Shallows. But that old dichotomy appears to be on the verge of exploding–in no small part due to the same guy who urged us to Think Different. With the advent of mobile devices like the iPad and countless other digital reading platforms that are on the cusp of coming to light, the digital reading experience is quickly getting on par with paper. And reading is slowly morphing into a social experience; Amazon is introducing features for the Kindle that allow the reader to see what others have highlighted. Features like this, blended with a digital reading experience that mirrors print, will take digital media into a whole new realm. These changes–and the rapid pace of change–pose huge challenges for the publishing industry. But it’s no longer just a question of free versus paid on the Web? That old debate is looking increasingly quaint. The deeper question is: What do we want to become now that the revolution is over? In other words, now that digital media is becoming media, what should it be? What should our books become? How should our magazines and Web sites evolve? And how can they make money going forward? It’s one thing to scream from the rooftops that “information wants to be free,” but it’s quite another to reinvent an industry that’s poised for long-term growth. And most of us never signed up for this. As Tammy Erickson, a consultant and expert on generational issues in the workplace, says: Gen X is “one with many members who are profoundly dissatisfied with corporate life as they see it.” So, perhaps, Gen Xers will continue to peel off and do their own thing and let the Gen Ys (who were weaned on digital, seem to get along just great with their boomer idols, and don’t have all the scars of the dotcom bubble days) take our established businesses forward. Joshua Macht is the Group Publisher for the Harvard Business Review Group.